27th Infantry (City of Winnipeg Regiment) Bn, 6th Brigade, 2nd Canadian Division, C.E.F. 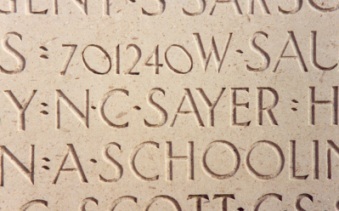 Norman Sayer, a farmer, enlisted in Moosomin, Saskatchewan on the 4th January 1915 and was posted to be part of a Cavalry Draft for the 10th Canadian Mounted Rifles. He was transferred to the reserve regiment of the Lord Strathcona’s Horse in June 1916 and sent to England, however with the great need for men in the infantry his days as a cavalryman were numbered; in September he was posted to the 11th (Reserve) Infantry Battalion. While he was in England, he had the opportunity to visit family and friends in Malvern, including the Revd Charles of Malvern Link Free Church. On the 27th September he was finally transferred to a draft of the 27th Infantry Battalion and landed in France on the 28th. 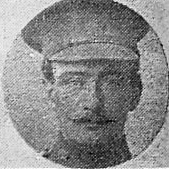 He arrived at this unit on the 10th October and saw active service throughout that winter and into the following spring. Awarded a badge for Good Conduct in January 1917 he was to be involved in the historic Canadian breakthrough on Vimy Ridge on the 9th April. The French had attempted to dislodge the Germans from this important stronghold, and the British had also been thwarted in their attempts. It was only with meticulous planning, including the digging of miles of tunnels (that allowed the necessary men to amass without being seen) that allowed the Canadian Corps to breakthrough. Norman Sayer was killed in fighting on the following day – either as a direct result of the breakthrough on the 9th or because his unit was brought in to continue the advance. In his memory, his parents erected a seat at the junction of Church Road and Lower Howsell Road in Malvern Link. It was recently replaced, but the memorial plaque has been attached to the new bench.